Hi Blog friends! I hope everyone had a good weekend. As I mentioned on my last post I crocheted two bikini cover ups last month and I will share the photo. So, the TADA! Two bikini cover ups for summer. I was so inspired by my first summer here in the US and our new home sweet home that I spent most of last month doing these dresses. 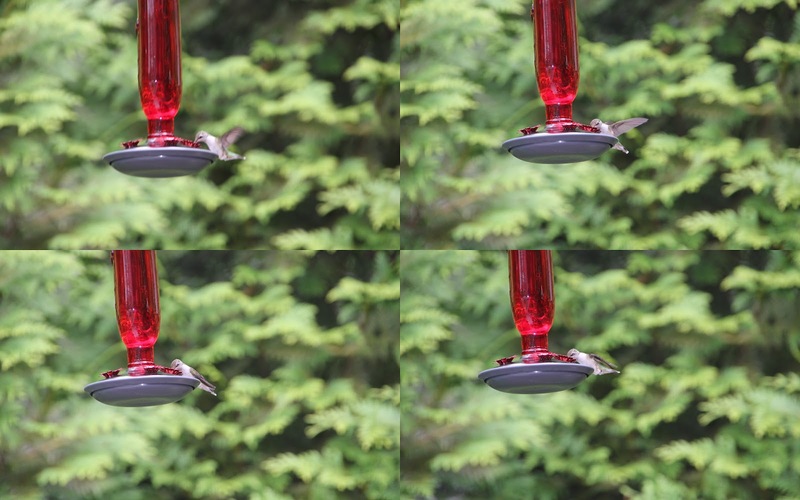 Anyways, I think hummingbirds are so pretty amazing and beautiful that I need to share the photos that I captured while they are enjoying the feeder that I made yesterday afternoon, made of sugar and water. They love it and kept coming back for more. There are two of them one is red and the other is green. They're so cute! Have a great week everyone! THANK YOU SO MUCH for all the wonderful comments love all of them. crocheters rocks! No I can't make them.. They are really beautiful.. I like the pink one so much..
the pink is much easier pattern but it took me 10 trials before i finally got it. thank you beck. everything nice..the bikini, hummingbird, too many flowers in your backyard..i love it..emmm jealous! Woo hoo! Love your bikinis!!! They are just so cute! I had a plan of making one but still pending now! What size of crochet thread did you use? So beautiful! Love those hummingbirds, they are so lovely, aren't they? the crochet threads are from the philippines, and i have no clue :P but the brand is monaco. Your blog is lovely and our creations are amazing! What beautiful work! Exquisite! Love the hummingbird pictures. I may need to offer a tremendous continue for the broad information you have here on this post, Thank you for sharing this post.